t is 16th May 1568. A small fishing boat is preparing to sail across the Solway Firth. 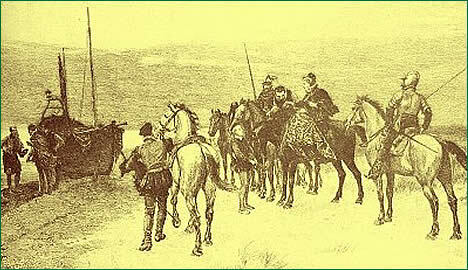 A group of figures on horseback arrive to meet the boat. The men are armed, but appear anxious, as though they are being followed. One of the riders is a woman. She is plainly dressed but clearly the centre of attention. Looking tired, she is helped off her horse and guided down to the waiting boat. At the water's edge, she pauses to thank her companions who kneel before her. She turns to take a last brief look at her Scottish homeland and then steps into the boat. On the far bank she can see the hills of England and an end to her many cares. The woman is Mary Stuart, Queen of Scotland. Why is she making this journey? How did she come to be in this situation?